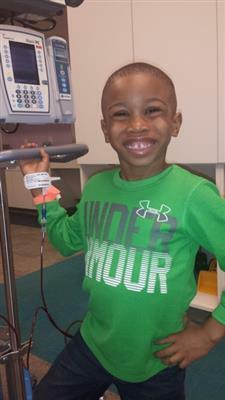 Joshua Jules was born with Sickle Cell Anemia. He began exhibiting symptoms at 18 months. These symptoms consisted of pain crisis, which feels like a stabbing, lasting 5 days - 2.5 weeks. The crises are sporadic and can occur without notice. In addition to severe pain crises, Sickle Cell Anemia also reduces the lifespan of its host by slowly impacting the organs. The average lifespan of someone with sickle cell is 40. On average, Joshua’s pain crises occurred monthly. Many crises were treated at home with medication. The Jules family would treat at home for seven days and if no relief, it was off to the ER where Josh was hurried into a room. Josh was in the hospital at least quarterly. The Jules family (Josh, Kaleb - Josh’s older brother, Gen – Josh’s Mom and Karim - Josh's Dad) logged many hours in the hospital and spent many weekends there as well. As one can imagine, Karim and Gen were heartbroken for their son and struggled with regret that they had given such a terrible disease to him. Apart from the Sickle Cell Anemia, Josh was a normal boy (as troublesome as ever) who loved to play. He’d always ask if the family could go to the neighborhood pool. His parents had to avoid the question (and the pool) because any change in body temperature could trigger a crisis. One can only imagine the Jules' excitement when they found out that Kaleb was a DNA match to save his little brother. Karim says he will never forget the look of fear on Kaleb’s 7-year old face when he explained that he had “special seeds” which could cure his brother. His immediate thought was the pain of this ordeal. Kaleb’s fear turned into courage as he understood the significance of the bond he and his brother shared. In the months leading up to the Bone Marrow Transplant (BMT), Kaleb never hesitated to remind his parents to be very careful when caring for him because his “special seeds” were going to save the day. Gen took a break from corporate America to care for Josh full time. Karim says, "thanks to her, Super Kaleb, Texas Children’s, organizations like His Grace Foundation, Blue Cross Blue Shield and lots of prayer, Joshua had a successful BMT." Josh spent six – seven weeks in the hospital and then returned only for checkups and testing. As of May 29th (Josh's BMT anniversary and his parents' wedding anniversary) Joshua’s recovery has been flawless. His numbers are great. Josh’s doctors call him the perfect BMT recovery case. These days, both Josh and Kaleb are taking swim lessons in preparation for a summer vacation to St. Croix, USVI where they will be greeted by both sets of grandparents, aunties, uncles, cousins and many others who’ve prayed for them on this journey.